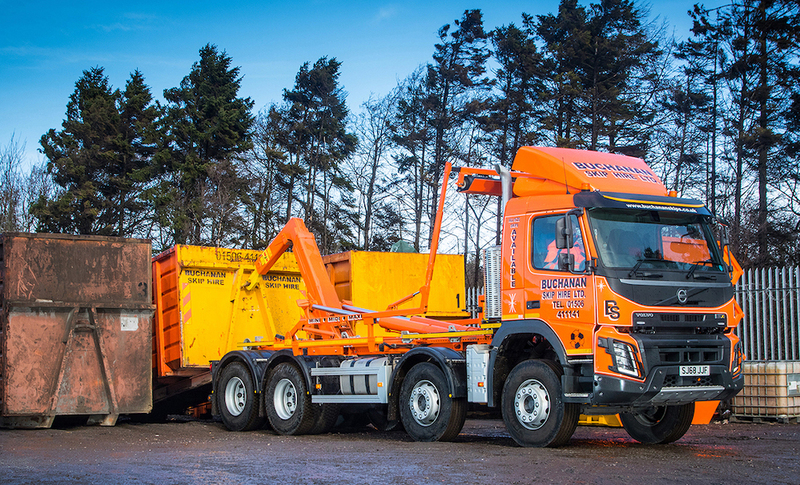 West Lothian-based, Buchanan Skip Hire has purchased its fifth Volvo truck – an FMX 8×4 rigid equipped with Tandem Axle Lift and a hook lift body – which joins four Volvo FE skip loader vehicles in a mixed marque fleet of 21 trucks. “Our last five vehicle purchases have all been Volvo trucks sourced from a mixture of stock trucks and specific orders. 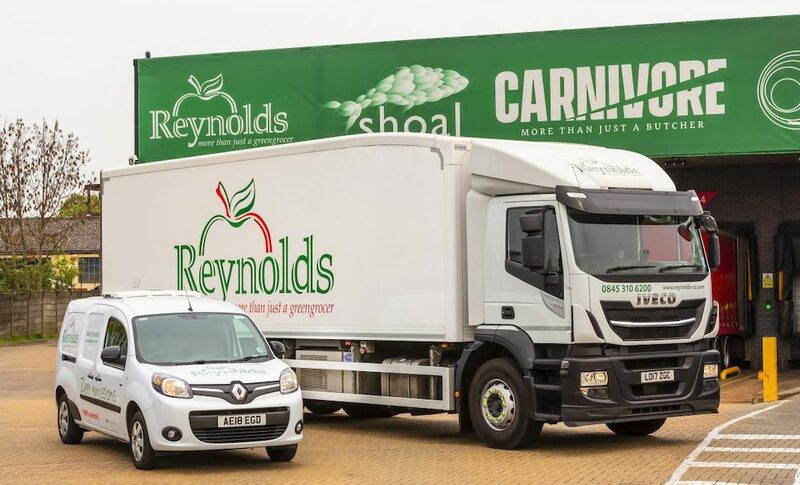 Every one has the additional lower passenger door extra glazing panel, whichincreases driver visibility levels,” notes John Cunningham, Transport Manager at Buchanan Skip Hire. Supplied by Sean Merrick, Transport Solutions Executive at Volvo Truck and Bus Centre North & Scotland, the 5,100mm wheelbase Volvo FMX rigid chassis is fitted with a Multi-lift Hook lift body by Hyva fitted at Bulkweld, Broxburn and will be used on the company’s services acrossEdinburgh, West Lothian and Falkirk areas. Powered by a Volvo D13K Euro-6 engine producing a maximum 420hp, the FMX rigid is also equipped with an I-Shift 12-speed automated transmission system and features rear air suspension, an Extra-High Chassis and RTS2370A single reduction tandem 23tonne drive axles with differential and cross locks. The Day Cab also contains Driving and Living packages. Volvo’s unique Tandem Axle Lift was also specified, which offers improved manoeuvrability and a reduction in fuel consumption levels; Tandem Axle Lift is ideal for waste industry operators like Buchanan Skip Hire who regularly drive heavily loaded in one direction and empty in the other. When the truck is unloaded, a button is pushed on the dashboard to disengage and raise the drive axle. 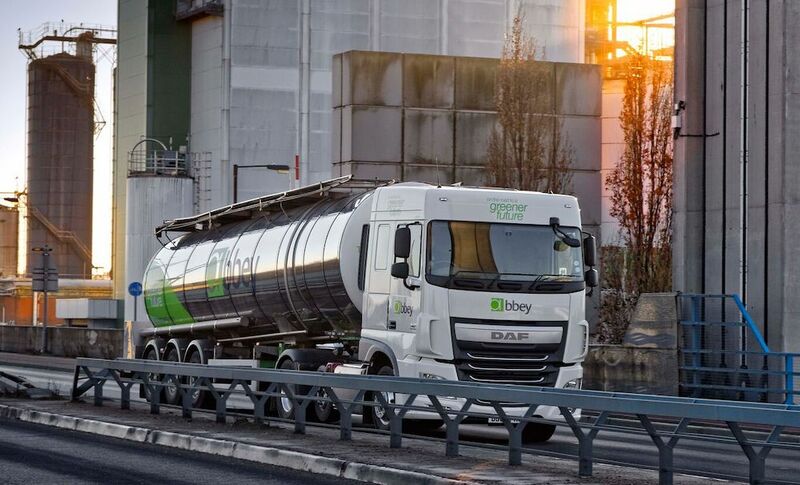 As soon the truck is loaded, the drive axle automatically lowers and engages to ensure maximum traction and driveability. It only takes about 15 seconds from start to finish, so no valuable time is wasted. 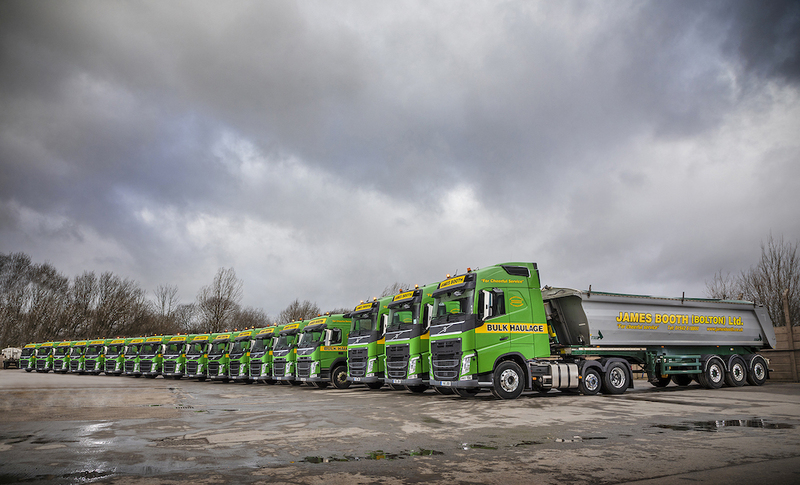 The truck was also supplied with a four-year Volvo Service Contract, which will be carried out at the nearby Edinburgh dealerpoint of Volvo Truck and Bus Centre North & Scotland. “All our Volvo Trucks benefit from Dealerpoint Service Contracts and with these packages there’sno interruption to our daily work schedules. We drop the vehicles off during the back shift andthey’re always ready to go the next morning,” John reports.